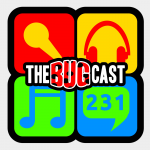 the bugcast 231 – OMG BABIES! The big news of this week, along with 8 great pieces of music. The big news of the week!! The next show will be episode 232 – broadcast live in the chatroom on Friday 12 October from 21:30 UK time.